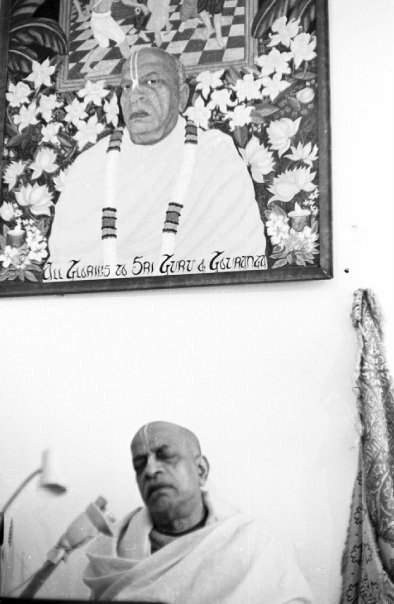 The initiation ceremony consisted of Bhaktivedanta Swami singing prayers of purification to his guru and to the past spiritual masters. A sacrificial fire was built, and rice and barley soaked in ghee were thrown into it, as well as dyes of red, green, yellow, white, and blue. At the end of the ceremony, bananas were put into the fire. All were offerings to Krishna who, with the fire, burns up all past imperfections. I handed the Swami a bulky strand of 108 large, red, wooden beads, and he chanted on them. Somehow the fad of the large wooden beads became the status quo. Some mixed the the colors: reds, blues, and yellows. Swamiji just accepted this, without saying anything about the tradition of using Tulasi beads. Later, when I was instructed by Swamiji in this matter, I replaced the red beads with the traditional Tulasi beads, and he chanted on them, too. As the fire ceremony (yajna) progressed, my mind was reeling and racing. The Swami handed beads back to another initiate and said, "Your name is Shyama devi dasi." He handed me my beads and gave me my spiritual name. Up to that point, the spiritual names had all corresponded with the first letter of the name we were given at birth; for example, Robert became Rupanuga, Bruce became Brahmananda, and so on. At first Swamiji said, "Your spiritual name is R . . . "
So many things were going through my mind at once, I didn't hear the name. The fire was crackling; the crowd was talking and singing; my head was filled with sounds, smells, and a thousand pictures and thoughts. I wasn't sure if I'd made the right decision. Was I giving up my freedom and fun? Why was I suddenly getting initiated when I was a freewheeling, music-playing, go-anyplace-meet-anyone-do-anything adventurer? "Oh well, this is an adventure too," I thought. The chanting started to soothe me, and the sweet smell of the flower garlands and incense calmed me down. Random thoughts surged through me, but as I viewed the Swami's strong, calm face and his expert hands organizing the fire sacrifice, I accepted everything. I didn't know my new name, but it didn't matter. After a very short pause, Swamiji said, "No, your name is Gurudas." The guests and witnesses oohed and awed. Gurudas, 'the servant of the guru,' I liked it. It fit like the top to a pot. As the Swamiji and I became closer and closer, I became Gurudas. Joan was initiated as Yamuna, like the river in Vrindavan, India (sometimes spelled Jamuna) where Krishna played. That night, after the initiation ceremony, Yamuna and I went to see the Swami, and he greeted us with his vast, oceanic smile. "You are both great devotees of Krishna." We were silent but comfortable. After some moments, Yamuna asked, "When do you want us to get married?" "Tomorrow," the Swami replied. He did it again! He was making me surrender my restless nature. I felt like I was playing hide and seek with Swamiji and Krishna.